The series is dedicated to Search And Rescue internationally, across the range of SAR services and including the treatment and rehabilitation of rescued casualties. The first issue of this new serial publication led with the story of the IMO 2012 Exceptional Bravery At Sea Award, made to a rescue swimmer of the Chilean Navy. The issue then reviewed the rescue and the SAR services maintained by the Chilean Government and the CVBS volunteer lifeboat service. DESCRIPTION: The series is dedicated to Search And Rescue internationally, across the range of SAR services and including the treatment and rehabilitation of rescued casualties. 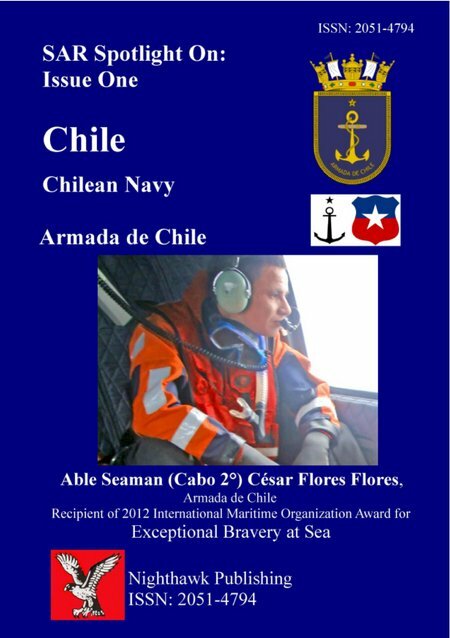 The first issue of this new serial publication led with the story of the IMO 2012 Exceptional Bravery At Sea Award, made to a rescue swimmer of the Chilean Navy. The issue then reviewed the rescue and the SAR services maintained by the Chilean Government and the CVBS volunteer lifeboat service.